WASHINGTON -- The Trump administration is ending special protections for Salvadoran immigrants, forcing nearly 200,000 to leave the country or face deportation, officials said Monday. El Salvador is the fourth country whose citizens have lost Temporary Protected Status under President Donald Trump, and they have been, by far, the largest beneficiaries of the program, which provides humanitarian relief for foreigners whose countries are hit with natural disasters or other strife. Two U.S. officials discussed the decision on condition of anonymity with The Associated Press because they were not authorized to speak publicly ahead of the announcement. One official said Salvadorans will have until September 2019 to leave the country or adjust their legal status. Homeland Security Secretary Kirstjen Nielsen's decision, while not surprising, will send shivers through parts of Washington, Los Angeles, New York, Houston and other metropolitan areas that are home to large numbers of Salvadorans, who have enjoyed special protection since earthquakes struck the Central American country in 2001. Many have established deep roots in the U.S., starting families and businesses over decades. It also represents a serious challenge for El Salvador, a country of 6.2 million people whose economy depends on remittances from wage earners in the U.S. Over the last decade, growing numbers of Salvadorans - many coming as families or unaccompanied children - have entered the United States illegally through Mexico, fleeing violence and poverty. In September 2016, the Obama administration extended protections for 18 months, saying El Salvador suffered lingering harm from the 2001 earthquakes that killed more than 1,000 people and was temporarily unable to absorb such a large number of people. 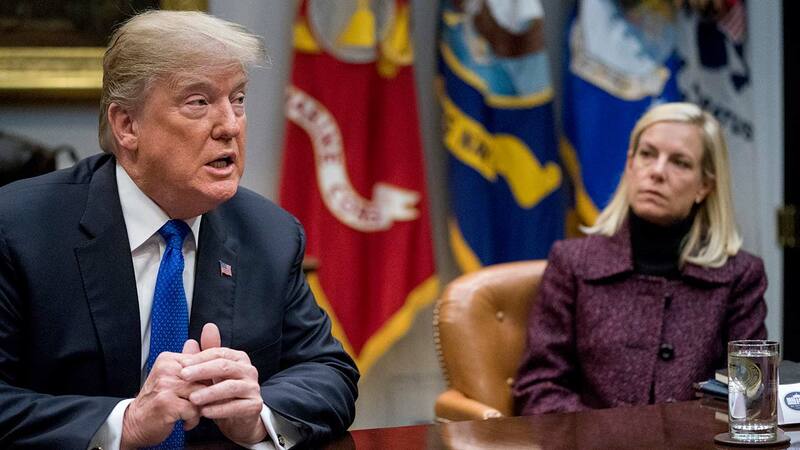 Homeland Security Secretary Kirstjen Nielsen faced a Monday deadline to decide whether to grant another extension. El Salvador President Salvador Sanchez Ceren spoke by phone Friday with Nielsen to renew his plea to extend status for 190,000 Salvadorans and allow more time for Congress to deliver a long-term fix for them to stay in the U.S. The decision comes amid intensifying talks between the White House and Congress on an immigration package that may include protections for hundreds of thousands of young immigrants who came to the country as children and were temporarily shielded from deportation under an Obama-era program. Trump said in September that he was ending Deferred Action for Childhood Arrivals, or DACA, but gave Congress until March to act. The U.S. created Temporary Protected Status in 1990 to provide a safe haven from countries affected by earthquakes, floods, hurricanes, war and other disasters, and it currently shields nearly 320,000 people from 10 countries. There are nearly 440,000 beneficiaries from the 10 countries, including 263,000 from El Salvador, but many have obtained legal status other ways. The benefit, which includes work authorization, can be renewed up to 18 months at a time by the Homeland Security secretary. Critics say it has proved anything but temporary - with many beneficiaries staying years after the initial justification applies. Nielsen said last week that short-term extensions are not the answer. "Getting them to a permanent solution is a much better plan than having them live six months to 12 months to 18 months," she told the AP. In November, Nielsen's predecessor, acting Secretary Elaine Duke, ended the protection for Haitians, requiring about 50,000 to leave or adjust their legal status by July 22, 2019, and for Nicaraguans, giving about 2,500 until Jan. 5, 2019. She delayed a decision affecting more than 50,000 Hondurans, foisting the decision onto Nielsen. Last year, the Trump administration extended status for South Sudan and ended it for Sudan. Other countries covered are Nepal, Somalia, Syria and Yemen.